Saanya Gupta is a Bronze, Silver and Gold Award Holder who has been an active Award Volunteer and Award Leader at the National Award Office since December 2009. With an outstanding background in the Award, Saanya has been crucial in setting up systems, formulating the Strategic Plan and managing events. A student at the Hansraj College, University of Delhi, Saanya is currently pursuing her Bachelors in Economics and Philosophy. Her enthusiasm and 'out of the box' thinking has been instrumental in the strategy development and functioning of the "Award in Universities'. In the year 2010, Saanya was a crucial member of the Events team. She takes keen interest in sports and was key organiser of the 'Youth and Sports' photo exhibition, with Ridhima Oberoi and artist Prenita Dutt, held at the British Council on 24th November 2010. In the month of January, Saanya successfully entered over 800 Award registration forms to the Award Database management system. 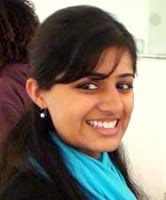 She works for the College Promotions team and believes that 2011 will be an important year for the Award in India.